A bumblebee lands on a flower, pollinating the plant. Global warming is putting the squeeze on bumblebees. In the most comprehensive study ever conducted of the impacts of climate change on critical pollinators, scientists have discovered that global warming is rapidly shrinking the area where these bees are found in both North America and Europe. 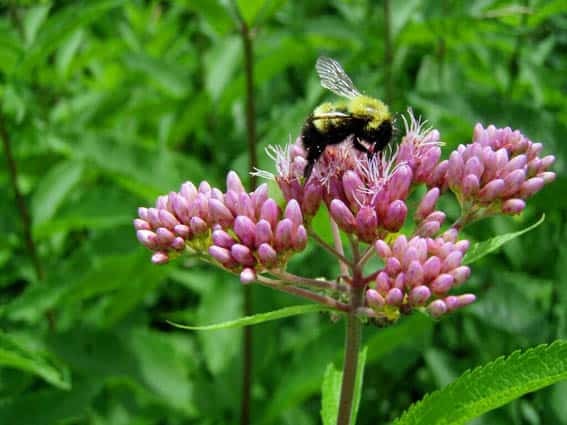 Researchers examined more than 420,000 historical and current records of many species of bumblebees and confirm that bumblebees are in steep decline on a continental scale because of climate change. The new research is reported in the journal Science. Many species of animals, including butterflies, have been observed to expand their territory in an effort to adapt to climate change: the northern edge of their range marches toward the North Pole, while the southern edge remains in place. Not so bumblebees. The team of 14 scientists who conducted the new study found that northern populations of many bumblebee species are staying put—while the southern range edge is retreating away from the Equator. The new study shows that the culprit is not pesticides and it’s not land use changes—two other major threats to bumblebee populations and health. Instead, the research shows clearly that this “range compression,” as the scientists call it, tracks with warming temperatures. To conduct their study, the scientists drew on geo-referenced databases from museum collections on both continents. In Vermont, Richardson examined bee specimens at UVM’s Zadock Thompson Zoological Collections. Over the 110 years of records that the team examined, bumblebees have lost about 185 miles (300 km) from the southern edge of their range in Europe and North America, the scientists estimate. “The scale and pace of these losses are unprecedented,” said Ottawa’s Jeremy Kerr. There may be an evolutionary explanation for the problems bumblebees now face. Many other species of insects originated and diversified in tropical climates; as temperatures warm, their evolutionary history may allow them to better adapt. Bumblebees, however have “unusual evolutionary origins in the cool Palearctic,” the scientists write, which may help explain their rapid losses of terrain from the South and lagging expansion in the warming North. To respond to this problem, the research team suggests that a dramatic solution be considered: moving bee populations into new areas where they might persist. “Assisted migration” has been considered—and controversial—in conservation biology circles for more than a decade, but is gaining support as warming continues.